Home › Digital Extra post › Turkish Airlines partners with Warner Bros.
Turkish Airlines partners with Warner Bros.
Turkish Airlines has launched a partnership with Warner Bros. Pictures on the highly anticipated action adventure film, Batman v Superman: Dawn of Justice. In the movie, a pivotal scene unfolds aboard a 777 Turkish Airlines plane. Outside the movie, Turkish Airlines is unveiling innovative movie-themed experiences that give fans around the world an inside look into the world of the iconic Super Heroes facing off for the first time on the big screen when the film comes to cinemas worldwide beginning March 25. Drawing inspiration from the film, Turkish Airlines has created an array of experiences, beginning with an invitation for travellers to “book” flights to two new US destinations – Gotham City and Metropolis. Turkish Airlines currently flies to 113 countries, with flights to 284 destinations – now including the home cities of Batman and Superman. Beginning Feb. 8 through mid-March, Turkish Airlines is inviting fans and newcomers alike to visit turkishairlines.com/flytogotham or turkishairlines.com/flytometropolis to reserve flights and begin their journey into the world of Gotham City and Metropolis. In doing so, participants will get an exclusive virtual view into the life of each city, including the activities, culture, nightlife and more. 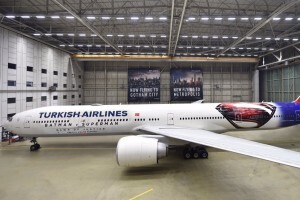 With the Gotham City and Metropolis virtual experience as the centrepiece of its partnership with Warner Bros., Turkish Airlines is also sponsoring the movie’s premieres and will offer eight lucky fans the opportunity to attend one of the gala events. Turkish Airlines has also started unveiling its movie-themed activations, including: An exclusive 777 Turkish Airlines wrapped in Batman v Superman: Dawn of Justice imagery; Limited edition movie-themed in-flight amenity kits for adults, which includes an eye mask and slippers; Limited edition movie-themed in-flight amenity kits for children, including headphones, slippers and a watch; Movie-themed in-flight menu items, such as branded cookies and cupcakes; A Time Out travel guide featuring content focusing on Gotham City and Metropolis, which will be distributed to moviegoers, passengers and at select venues; A special edition frequent flyer Miles & Smiles card. Fans can join the online conversation around the movie using the hashtags #flytogotham and #flytometropolis.